5 Channel, 120 Watts, 8 Ohms, 70/100V Mixer & Amp. 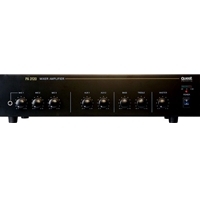 With five channels of mic/line inputs, the PA-3120 is ideal for the café, small office complex, workshop, factory or any moderate sized commercial distributed paging/music environment. Total power 120 watts RMS single zone 70/100V or 8 ohm output and line out for extra slave amplifiers. Output Power – 120 watts RMS 180 watts peak.